The following article is based on the principles and techniques taught in the Knife Defense videos. Much has been written about the effectiveness of one system or another in a realistic or “street” situation. Many styles claim to be scientifically designed or to have secret techniques to defeat even the toughest of opponents, including armed assailants. Yet when it comes to an assailant armed with a knife, you don’t need to learn a lot of fancy, secret techniques, you only need to remember four simple options. In an armed confrontation, basic is best and the most direct techniques are the ones that will give you the opportunity to walk away when it’s over. When faced with a weapon, you have four choices: retreat, lateral inside close, lateral outside close or pass by. Each of these initial movements allows you to shorten the distance between you and your opponent. Once you get close, you can apply the defense of your choice. If you prefer kicking, you can use a kick. If you prefer locking, you can apply a lock. If you prefer grappling, you can take your opponent to the ground. But to use any of these skills, you first have to get close to your attacker. Or run. Fast. To retreat is generally seen by the opponent as a sign of cowardice. You are too afraid to fight or you are unable to match your opponent’s strength, so you step back to avoid being drawn into a confrontation. However, the retreat can be a smart initial move since it gives you a chance to measure your attacker’s seriousness and prepare a strategy. And there is always the chance that when you signal a retreat, your attacker will back off enough to let you escape. This is, of course, the safest and most intelligent way to defeat an armed attacker. It is also the least likely outcome. The other option is to retreat a step or two to give yourself time to collect your thoughts and ensure you are in the safest possible position to defend yourself. You can use a retreat to gain better footing, adjust your stance or height to your opponent or maneuver for the best position in a confined space. You also can use a retreat to take control of the timing and distance of the confrontation. When you begin to retreat, your attacker is forced to react to you. Now you are in control, at least for the moment, of how fast the situation is moving. You can find the distance most comfortable for you and prepare to retaliate when you are ready. While retreating, you should be observing your opponent’s position. Is he holding the weapon in his right or left hand? Is he bigger or smaller than you? Does he appear to have any obvious weaknesses? Is he quick or slow? Is there anything behind him or out of his line of view that you can use to your advantage? Does he see your retreat as a sign of weakness or does it make him nervous? There are many signals, both overt and subconscious, that your attacker will give off. By being observant, you can prepare your next move. While a retreat is the most sensible option available, it has disadvantages that make it a poor choice in some situations. Obviously, it is not an option in a confined space. And while you gain a physical advantage by retreating, you lose a major psychological advantage. The minute you step back, the psychological upper hand goes to your opponent. He will see you as weak, uncertain, inexperienced and perhaps unskilled. Although you may have a plan of attack all thought out, he sees only your retreat and gains courage from it. If you do have a plan, you can regain the advantage by using it when he thinks you are about to give in. If you do not have a plan, your fear will only be magnified by retreating. The lateral close is the most commonly taught method of defending against a thrusting, lunging or cutting attack. There are two methods of using the lateral close. The first is to side step your opponent’s forward movement. When the opponent attacks, you step either to the right or left of the attack while maintaining your ground. The result is that you end up very close to your opponent on the right or left side of his body. The second method for lateral closing is to move diagonally toward your opponent. Before your opponent moves forward to attack you, you make a preemptory strike by stepping out to the side and toward him. The result is that you move into your attacker’s space and end up very close to the left or right side of his body. Both methods allow you to effectively close the distance while avoiding the attacker’s weapon. And the key to defending against any weapon is to effectively and quickly get close to the assailant. The weapon wielding attacker’s biggest asset is space. By holding a weapon, he extends his range of attack by several feet and thereby shortens your range. Once you pass by the outer reaches of his range, the place where he is holding the weapon, you blunt his options for attack and take away his advantage. When you get very close, you force him to resort to grabbing you or blocking your attack, distracting his attention from his weapon and lessening his advantage still further. There are two types of lateral closes: the outside close and the inside close. Each type describes the direction of your movement relative to your opponent’s body and can be executed using either of the above methods. In the examples that follow, we will assume you are defending against an attacker who is stepping or lunging forward to attack you. The outside close is the safer of the two types. 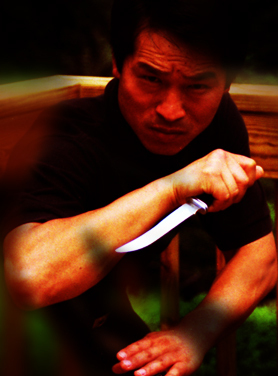 To execute, face a partner who is holding a training (rubber or wooden) knife in his right hand. When your partner steps toward you and thrusts the knife at you, step out to your left just far enough to let the knife pass by you. Use your hands to guide your partner’s arm as it passes by you while getting a firm grip on his wrist or forearm with your right hand. If you did the technique correctly, you should find yourself standing very close to your partner’s upper arm or shoulder and your right hand should be holding your partner’s attacking hand firmly at your side. When performed correctly, the advantages of the outside close are significant. It puts you outside of the line of attack. It reduces your chances of getting cut. It puts you in the advantageous position of being almost behind your attacker. And it makes your opponent feel very vulnerable because he now has to turn around to defend himself. To make your outside closing more effective, practice building speed and accuracy in your initial movement and learning to anticipate how your attacker will move. If you anticipate correctly and move quickly, the outside close is an almost perfect defense. Once you complete the successful close, you can apply a variety of finishing techniques. You may choose to strike to the back of the head, spine, or behind the knee. Or you may prefer to apply a choke, headlock or armlock from behind. If you are very skilled in restraining techniques, you can use an arm lock to take away the knife or force your attacker into submission. The lateral inside close is somewhat more risky but much more intimidating. To perform an inside close, face your partner as in the first example. When you partner steps in and attacks with his right hand, move to your right and toward the centerline of your partner’s body while holding on to his attacking arm with your left hand. When done correctly, you should end up right in front of your partner’s chest and face, while holding his right arm at your side with your left hand. This is clearly an intimidating position for your partner because you have cut his weapon off from his line of vision and you have placed your body between him and his weapon making it impossible for him to attack you with it. You have also exposed key targets for attack, including the critical targets on the centerline of his head and body. From this position you can easily strike his face, possibly taking away his vision. You are also in a position to attack his throat, groin and vital organs of the chest/stomach. However, you have now presented him with the same opportunities, which makes the inside close a risky move for inexperienced martial artists. 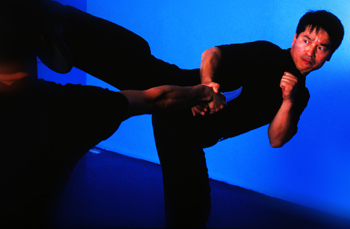 Once you use the inside close, you must have a specific plan to finish your attacker quickly, either by striking the vital areas or by applying a controlling technique, such as a takedown or an arm lock. You must also be acutely aware of your opponent’s actions and prepare to defend against a renewed attack from his free hand or his legs. The final technique for closing the distance against a weapon is one that you won’t see taught often. It is the most dangerous, both to the attacker and the defender, and it is recommended only for experienced practitioners. The pass is dangerous even in practice and should only be practiced by martial artists who are skilled in falling and do not have any preexisting back or neck injuries. Always practice on a soft surface and never at full speed. With these cautions in mind, have your partner face you as before and move forward with a right handed attack. Step out to the left, as if performing an outside close, but take two steps by your partner so that you are behind him. You have now “passed” your partner and have several options. You may grab his hair, head or shoulders and pull him backwards. You may apply a choke or lock from behind. You may kick his spine, tailbone, or knee to knock him forward. Or you may strike the back of his head. To be effective, the pass and follow-up technique should be performed as a single move. In an instant, you have to move by your attacker and apply a single deadly attack before he realizes where you are. The result of a correctly performed pass is that your attacker never sees it coming and is literally blindsided by your attack. If you choose to pull the attacker backward, he will certainly hit his head to the ground, knocking him unconscious if the ground is hard. If you push him forward, he will likely hit his face on the ground, causing the same result. If you choose to strike him from behind, he will suffer a full force blow with no warning or defense, a potentially lethal strike for even the biggest opponent. The pass is not recommended for beginners. You run the risk of becoming disoriented or losing your footing when you move so quickly and with such force. You also risk being tripped by yourself or your assailant as you pass by. And finally, you run the risk of not being fast enough to complete the pass and not getting a grip on your opponent to control his weapon either. For these reasons, the pass is taught only at the highest levels of weapons defense and should be applied with great care. Which method you choose to close the distance depends on your skill level and experience. For beginners, practicing the outside close is safest. When you are comfortable with your speed and timing and can finish your partner easily from the outside close, practice the inside close. If you are very experienced and have an experienced partner, you can also experiment with the pass. Stay as close to your opponent as possible after you close. Focus on taking control of the knife first. Grabbing the knife wielding hand is always preferable to parrying/blocking. Cut off your attacker’s view of the knife. Close the distance quickly and smoothly. Never take unnecessary chances or use complicated techniques. Detach yourself from the fear you feel when faced with a weapon. Keep a natural demeanor and deceive your opponent. Move suddenly and without warning. In the above examples, we briefly touched on techniques used for finishing after you close the distance. Although the methods for closing the distance are only three, the potential number of finishing techniques are as vast as the arts we practice. Once you get close to your opponent, you can use your strongest skills, whether they are striking, kicking, throwing, locking or grappling. There are no secret weapons or scientific principles. There is only the simple truth that once you take away your opponent’s advantage, you are free to use whatever you are best at. Like this article? Learn more about knife defense techniques and strategies. 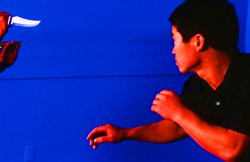 Watch Advanced Knife Defense by Sang H. Kim now. 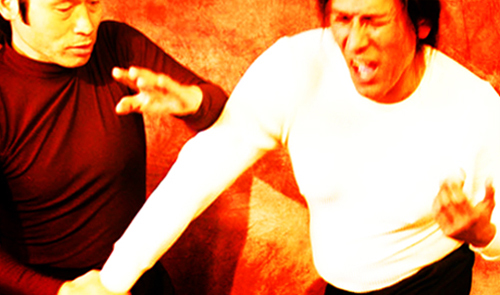 This entry was posted in Self-defense and tagged article, junsado, knife defense, principles, self-defense. Bookmark the permalink.